With plasterboard you can create a lasting finish for walls that can easily be painted or tiled over, ensuring the surface is even throughout the room. The plasterboard compound is made up of gypsum plaster sandwiched between paper or fibreglass and it’s becoming very popular in the building industry. Plasterboard ceilings and walls are often fixed with screws or cement, and come with mould and fungal resistance meaning they can be used in bathrooms and kitchens too. It can be cut to size quickly and easily, ensuring it can be used for any space. Plasterboard remains a cost effective way to deal with unappealing walls and ceilings, whilst also adding extra bonuses such as insulation. By using plasterboard instead of replastering the walls, you’ll be able to paint straight onto the surface without waiting for it to dry. Screws are used to fix the board to walls and ceilings, covering up the old and outdated surfaces. 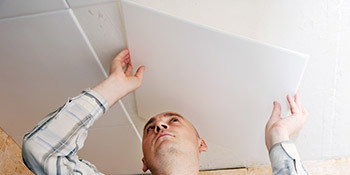 One of the major advantages of plaster boarding a ceiling or wall is that it can be cut to fit any size. Professionals will be able to cut and fit the plasterboard to any surface ensuring a smooth appearance throughout the room. Plasterboard doesn’t cost a bomb either. In fact it’s cheaper than replastering the walls or ceilings and will have a very similar end appearance. Because it doesn’t need to dry out, you can begin painting or tiling the plasterboard straight away, making sure you don’t lose time either. Plasterboard is a quick and easy way to change the look of your walls and ceilings, with little cost or hassle. For up to four FREE quotes from local, vetted and reputable suppliers, just complete our quick form and hear from the professionals. Project: Building work, also Plastering Celling and clearing building site. Project: Around 7 broken sheets of plasterboard collecting asap. First class service.quote was given within a couple of hours....on a Sunday and the job completed that afternoon.great work.great price. Jimmy was a perfectionist and worked for hours making the room look right. Friendly and approachable.